Stop pre order for the silver and antique silver since it is over-subscripted than 85% sold (inclusive of 10 sets for my collection). I need some stock for resell. Thx's for the fake news which did help in the selling and attract more customers. It is very low class of lies due to jealous. Lucky and chinessemedals (Aka barsenault) are lies all times high to competing with me and pretend naive. Check those lies up which both of them comments it is illegal company which not registered in china. 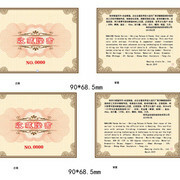 It can easily check online the company is registered under China with government seal as photo. Beware of these 2 cheaters in market. Beware of lies from Chinessemedals (aka Barsenault) and Lucky. Here the sold transaction of ebay for the rare 1986 WWF silver 5 Yuan fiat coin. 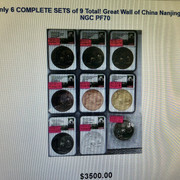 ONLY Pop 6 NGC for MS70 (bullion) and Pop 51 for PF 70 (proof). This was listed at ebay at 2K BUT sold at 1K. It is fiat coin and legal tender. Here the Nanjing Panda 2018 Great wall 9 pieces set which you rarely see the antique silver enamel. (5 available in open market with mintage 29). This was listed at ebay 4K in very short time compare to the fiat coin listing above. It sold at 3.5K. 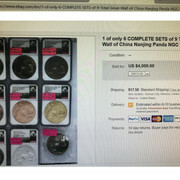 This has show and proven china mint forum statements which non fiat coin (aka medal) worth metal base value only. Majority of China Mint forum members are fiat coin (legal) tender lovers and against non fiat coin (aka medal) which they will try all means to denigrate medal by telling you half true and half baked information especially those project themselves as expert. This facts and happening has proven which they are wrong. In facts, legal tender and non legal tender with own collector bases and value. It is not non legal tender price will drop BUT legal tender will not. Those sold transactions above sold you which my sponsor items has more stable price as compare to some legal tender. However, I have to say this can happen in the other ways too. There is no risk free for both legal and non legal tender pricing. As you know majority of my sponsor items are come with well thought of design concept and stories other than just top quality in the medal with advance minting technique which cannot copy by others. Here the design concept and stories of 2019 Nanjing panda series (#2) Summer panda & Beijing Palace. This new panda series is the flagship of non-fiat panda coin series designs by Cheng Chao and sculptures by Feng Jie. This panda non fiat coin is 2nd year of the series. Planned 4th of the series spring panda -Great wall(1st), Summer panda - Beijing Palace (2nd), autumn panda (3rd) and Winter panda (4th). He has been given the nick name of China panda king designer among the local community of his outstanding achievements and contribution to the panda coins. Thus, Nanjing Mint will mint a new panda non fiat coin series in order to commemorate his achievements and contributions to China panda coins. This year the cute pandas actively and playful during summer by climbing to trees and enjoy the sunning summer with relaxing nature habitat. As Beijing Palace has been selected by few dynasties of China emperor as Administration centre of the empire and home. It is one of the resemble of Old China Kingdom and full of stories. The Lion statute at left represent male in china Culture and guardian of the Palace in many countries cultures. The whole concept of the design is a successful and happy man is going through his life journey via stone guardian (Lion statute) into the Huge Palace Gate with prosperous red doors by advancing his goals and living via the blessed and protected river bridge ( 护河桥) than reaching the top at the Beijing Palace Main building which represent the great achievement and fullest of your life and eventually perform the ritual at temple of heaven with blessing. The first stage is the stone lion statute, second stage is Palace gate and door, third is the blessed and protected river bridge, Fourth stage is the Beijing Palace Main building and fifth stage is the temple of heaven with blessing. Each stage represent each paths of life of you. 1 stage which we are well protected by our parent (Lion statute) 2 stage which we have just completed the college and start our living and jobs by passing through the Beijing Palace gate and door, 3 stage which we pass through and create peak of our live in careers and family via the blessed and protected river bridge, 4th stage which the Beijing Palace Main building that is the peak of our life and finally the temple of heaven bless us in your older ages. The box also is red color which means you open the box like open the path and gateway of the Beijing Palace Gate and doors and see the medal (Main building) with wow effect. Here the sample of the antique non PM Nanjing Panda 2019. It mint batch by batch which the antique treatment might be light and darker due to it is hand brush antique treatment instead of using machine. the antique treatment always make the contrast level of the design look much better. The antique brass enamel will not deliver together with bimet. 20 mintage silver 62 g ag.999 180 degree rotate above 650USD. 5 pieces left for sell only. PM for details. If hit target by all resellers which silver will left 15% and antique silver 12%. The coa sample have loss in hosting issue. Here you go. It states clearly it is by Nanjing official Mint which there is none BUT Nanjing mint as China official Mint in Nanjing China. So the rumour by the competitor are bassless. On top of it, there is none of any China official Mints and private mints OTHERS THAN Nanjing Mint can do this non-fiat coin with micro details high relief in 45mm instead of 40mm. Coa states clearly which Cheng Choa as the designer and he will sign on some of the coa. Deliver next week will start customer by customer. A bit sick and tired last few days. As usual an update of the sell status which Bimet 58% sold and Antique bimet 72% sold. The box likely red in color to reflect the Beijing Palace doors color. Silver has been booked by resellers which will gone fast. There is a special version of silver which mintage likely to be 20 subjecting to final approval. It will stated in the same coa of silver. Almost all gone for allocation. Take note the silver antique is at 69 mintage instead of 99 which expect fast gone too. Bimet 63% sold antique bimet 75% sold. Expected bimet will sold another 5% more at China known customer. Silver and antique silver will pre-order in April soon. The special varieties has been sold at more than 650 USD per pieces. NO reseller will get it so no need to approach them at all. Here the changes of the lion statute to correct position. It is sample picture which the delivery will be 1st week of April 2019 as schedule. Unfortunate, I cannot upload the clearer picture which show the temple of heaven dragon sharly. You will be super happy as when get it on hand. No comparison with others because none can mint it till now. I am happy to be part of the team which produce high end job. Nanjing Panda 2019 box design draft and actual. You will realise the Beijing Palace main doors are red. This the reason which box is read. You will go into Beijing Palace after opening the box. Sample coin in copper been done with bad picture. Lion position did it wrongly. Will need to pay & change it even done wrongly by them. however, it must be accoutsble instead of cutting corner by saving costs like other sponsors. Attached the specimen/prototype of Nanjing panda 2019. All above is 40 mm diameter. Just a sneak peek which the Greatwall will change to Beijing palace and temple of heaven. As the panda in 2018 is in spring mood which with plum flower. 2019 will be in summer mood which a lot of greenery. Design and mintage finalised which will release and inform in Mid Feb 2019. Year been passed. Nanjing Mint has started the first signature and flagship panda series to acknowledge Cheng Choa the panda king designer achievement in 2018. The 2019 design photo will publish in next few week and pre sale at mid February if the finalisation and approval stages are smooth. Expected another excellent work by the Nanjing Mint team.